My sister sent me this link about a location in Venezuela that gets an astounding 1.2 million lightning strikes each year. Known as Relámpago del Catatumbo, or “the everlasting storm,” it’s the result of a perfect confluence of meteorological and topographic conditions. Mariners have been aware of this phenomenon since the 15th century. Early explorers of the Caribbean used it as a “virtual lighthouse” to aid in navigation. Reading that article made me realize I had more to learn about lightning formation, so I did some research on the subject. Turns out studies are ongoing, and scientists still disagree on some of the details. So what I present here is our current best theory of the physics behind a lightning strike. The graphic shows the essential elements of a “thundercloud,” formally known as a cumulonimbus cloud. Its name comes from the Latin roots: “cumulus” = “towering” and “nimbus” = “rain.” That’s an accurate description of these meteorological monsters. 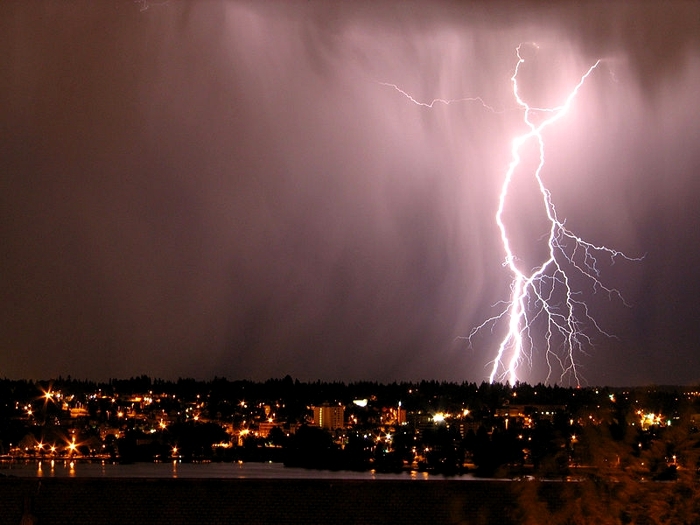 In addition to rain and lightning, they can spawn hail, dust storms, tornadoes, and microbursts. This is a complex topic, and there’s a lot going on in the graphic, so let’s start with the cloud itself. This is an “idealized” single-cell cumulonimbus. It shows a cloud formed by an updraft of warm and humid air, typical for here in Arizona during our monsoon season. At the top of the cloud, which can approach the edge of the troposphere, a classic “anvil” shape is drawn out by the prevailing wind. A large mass of warm humid air (red arrow) rises by convection, or is lifted by an impinging cold front, into higher and cooler regions of the atmosphere. At some altitude, usually between 1-4 km (0.6-2.5 miles), the temperature drops to the dew point. This causes the water vapor to condense into liquid droplets, and establishes the base of the cloud. At some higher altitude, usually above 2-3 km (1-2 miles), the temperature drops below the freezing point and the water droplets freeze into ice crystals. 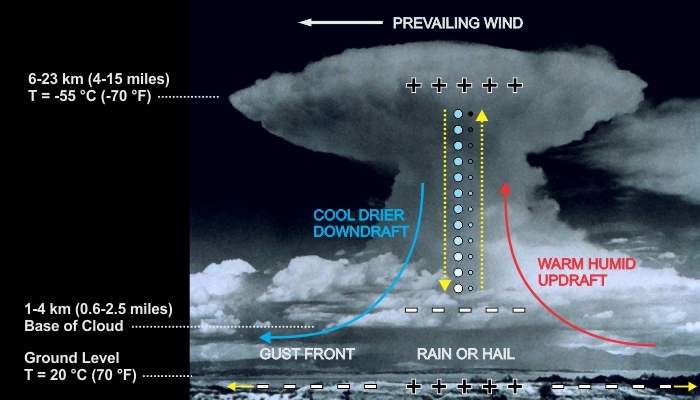 Cooler and drier air (blue arrow) falls under its own weight creating a downdraft that produces the strongest winds in advance of the storm — the gust front. That downdraft often brings rain and hail, and gust front wind speeds can reach 130-160 kph (80-100 mph) causing property damage and driving dust storms. Depending on the strength of the updraft, a given ice crystal can make multiple trips up and down through the cloud, sometimes overshooting the top of the anvil and entering the stratosphere. Extreme conditions like this can grow large, multi-layered hailstones that, only after several round trips, become heavy enough to fall to the ground. As ice crystals moving upward and downward collide with each other, the larger crystals (which are falling) pick up electrons from the smaller crystals (which are rising in the updraft). This leaves the smaller crystals with a positive charge, and the larger crystals with a negative charge. Ice is not normally listed in the triboelectric series, but the same idea applies. For some as yet unknown reason, larger ice crystals have a greater electron affinity and acquire negative charge over time. It’s much like what happens when you shuffle your slippers across a carpet, and then touch a light switch producing a spark. The large negative charge at the bottom of the cloud repels electrons in the earth below, causing them to stream away from the area under the cloud, and leaving an induced positive charge behind. It’s important to remember that only negative charges (electrons) are actually moving. Anything with a positive charge is missing electrons. When the charges build up to the point where voltage overcomes the resistance of air, your basic cloud-to-ground lightning strike happens. The strike may appear instantaneous, but occurs as a progression of stages. Only the last stage is visible to the human eye. Before the strike, electrons from the cloud first seek a path of least resistance to the earth. A branching trickle of charge called stepped leaders moves downward creating an ionized (conducting) path for the strike. As the leader nears the ground, a positive analog called a streamer trickles upward, often through tall buildings, towers, trees, and raised golf clubs. When a leader meets a streamer, the circuit is connected and a huge number of electrons (≈ 1020) discharge from cloud to ground. Take a look at the thumbnails below. The first is an animated GIF simulating the progression of stepped leaders. The second shows two massive strikes, the more-distant displaying leaders. 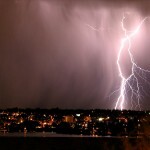 So to the best of our current knowledge, that’s what causes lightning. At least the most common kind. Next week we’ll examine a far simpler phenomenon that’s been well understood since the 1800s.